The building of hotels lends itself to modular construction because it reduces build times significantly, cuts costs and reduces the amount of waste. With more customers demanding eco-friendly accommodation options, hotels are leading the shift to offsite construction. Home2 Suites San Francisco Airport North by Hilton will open its first hotel using modular building components this year. The hotel suites are built offsite in factories to the highest quality standards. The building components are then transported to the building site where they are assembled. Since the components only need to be assembled onsite, there is less disruption, pollution and waste. For the Homes2 Suites Hilton build, the estimated time is approximately 13 months from start to finish—almost half the time for a traditional build of this magnitude. Without all the measuring and cutting that usually goes on in a traditional build, there is less room for errors and the quality is consistent. “Staying at the forefront of building trends has translated to faster construction and ramp-up times, making Home2 Suites one of Hilton’s fastest-growing brands,” said Adrian Kurre, Home2 Suites by Hilton. 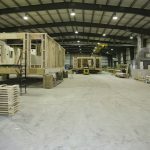 “Modular builds are eco-friendly, cutting down on the carbon footprint of construction as factories use recycled materials to reduce waste and energy-saving techniques throughout the construction process,” he said. Modular construction is helping the Hilton Hotel chain to achieve its goal to halve its environmental footprint by 2030. Major labor shortages in the construction industry have negatively impacted the hotel industry, causing delays in the opening of some projects. Turning to modular construction can help keep projects on schedule while reducing costs. While modular construction may seem like a natural choice, it’s widespread adoption by the industry has been hampered by a number of challenges. The first hurdle is to educate construction professionals on the advantages and applications of modular construction. Getting local governments to adjust building codes takes time. Design is also lagging as products that suit the industry need to be developed. There are a limited number of factories that produce building components and, if there isn’t one near your build site, transportation costs can be high. These challenges are being overcome, driven increasingly by demand from the hotel industry. Subscribe to Offsite News: Building Solutions in Wood to keep you on the cutting edge of offsite construction around the world. IWBC brings the world’s leading offsite, wood-based, automated construction innovators together with architects, engineers, builders, planners and others interested in fast, affordable, high-quality construction.